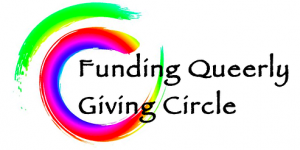 Funding Queerly is a giving circle. It’s a group of young donors who are working with Astraea Lesbian Foundation for Justice to mobilize funding for small LGBTQ community organizing groups in the US. We look to address the root causes of injustice facing LGBTQ people with a focus on people of color, rural folks and low income folks. Funding Queerly works as a cohort model with an annual cycle. We bring a group together starting in the late summer and finish in the early spring of the next year. Some members of the cohort stay on for the multiple cycles though they are not required to. The members identify as either young people with wealth or young people with class privilege. Everyone commits to making a personal gift and to fundraising from their networks to create a pool of money. We make decisions about the funding collectively. We try to do consensus-based decision making and if that doesn’t work we do a one-person one-vote model, but how much you put into the pool or how much you raise does not impact your voice in the group. We put out an RFP (Request for Proposals) in the fall after the first in-person meeting. Astraea Foundation manages that process for us. Everyone in the group reads RFPs and scores them; rather than trying to have every member read every single RFP, they are assigned out so that each RFP is read by at least two members and a staff person at Astraea. Then we collectively decide which applications are going to move to a site visit stage. We do the site visits by phone because it’s a giving circle with members across the US and we’re soliciting applications from all over the country. We have site visits with the groups that have moved on to the next stage and then we have an in-person meeting at the end of the site visits to decide on where to give the funds. We are fundraising from our communities throughout this whole process. Last year, we gave out $185,000 in grants that 12 people collectively gave and fundraised all of the money for. We got over 50 applications and ended up giving about 21 grants. They ranged in size from $5,000 to $10,000. We have a couple of different goals. One is to move money to an underfunded sector. LGBTQ issues get about 28 cents of every 100 dollars that gets granted from foundations annually, and LGBTQ communities of color get less than 3 of those cents despite being a big part of the LGBTQ community. Low income communities and rural LGBTQ communities also get a disproportionately small amount of funding. There is also a community building component for folks who are really interested in learning how to fund in this area. We get to learn together, share power and learn from folks who have a lot of experience funding in this area or doing this work directly about what they see as the most pressing issues facing the communities we fund. We do have some decision making criteria. We only give to small organizations – the maximum budget of an organization must be $250,000 a year in order to be eligible for a grant. The organizations have to be by and for LGBTQ folks. They also have to be led by members of the community that they’re looking to serve, and have to be by and for communities of color, rural communities and/or low-income communities. There was a moment when your story began. How did Funding Queerly get it’s start? We started at Making Money Make Change in 2012. The conference was a non-solicitation space but I was really feeling in a deep way the fact that in a space that had so many LGBTQ-identified people, there was no conversation happening around LGBTQ politics or funding and I wanted to start that conversation. I got up on a chair at lunch and said “If anyone wants to come talk about queer folks funding queer activism, particularly around racial justice, come meet me at dinner.” Twenty people showed up! The initial group was born out of that space and we’ve continued to do our recruiting primarily within the Resource Generation network. We didn’t come together to form a giving circle. We all wanted to move money in this direction and wanted to build community in doing so. 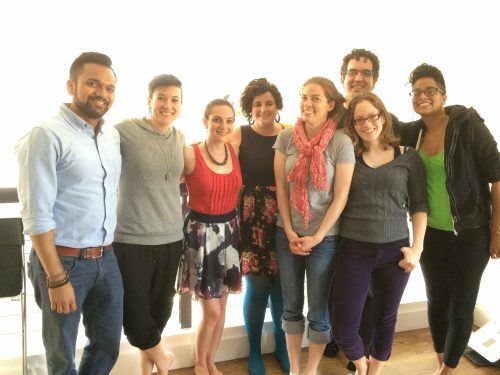 Before we even started building this cohort we spent a year figuring out what we wanted to do. We landed on this model through a couple of different pathways. We wanted something that was small enough that the people in the circle could develop relationships and build community. We also wanted to do something that would work for people who had limited capacity time-wise. Because of that, we realized we wanted to partner with a foundation to lift some of the administrative burden. We decided to go with Astraea in part because I work there and also because our funding interests are really deeply aligned with what Astraea does. We’ve been able to lean on the expertise of the staff to do some of the donor education for our members. *Check out SJF Northwest’s Indie Philanthropy story about their giving circle here. A big piece of resistance/criticism is about the fact that we are a group of wealthy and class privileged people deciding where the grants go. That’s both an external criticism and an internal criticism within the group. That is real – we are the people who have the access and we are having ongoing conversations about what the right way to do this is. We’ve had conversations with movement folks from other class backgrounds about how to do some harm reduction around this. We’ve asked if it would make sense to turn this into a cross-class giving circle, and several of the folks we’ve met with have said that they’d rather we keep it to wealthy people and move more money. It wasn’t necessarily what we wanted to hear, but we appreciated the honesty. We also decided to keep the group structured as it is because we mostly aren’t working in person and thus don’t have the time and capacity to do the deep trust building that would be necessary to doing a cross-class cohort responsibly. We’re looking for ways to get input from people from other class backgrounds with movement experience and we have questions about what that could look like when we come to decision-making time, but we haven’t been able to alter the process in a way that makes sense yet. We didn’t have a sense going in of how much time the giving circle would require. Before the first cycle, we couldn’t really tell the people who were interested in participating what they were actually signing up for. After the first cycle it’s been much easier to do this realistically. My advice would be that having a sense of what you are asking of people and pushing people to think seriously about whether they can do it is key. I also think it is valuable to build ways for people to be partially involved, so that folks who want to be involved but don’t have that much capacity have a way to tap into it. Also, for us it’s been really invaluable to have a foundation to work with. If you’re going to put out requests for proposals, the processing of those takes a lot of work and I’ve felt really grateful that we didn’t try to do that ourselves. In the end, that meant we had to pay a larger percentage of the total that we raised to Astraea, but I think we came out with better grants and a better process for doing it as a result. There are a couple of things. The first is that almost every single person involved has made a bigger gift to Funding Queerly than any other gift they’ve given before. Partially it’s because it’s a pool: their gift gets distributed through the giving circle and they don’t have to put their name on that number. For folks who are just getting started in philanthropy it can be easier to give a big chunk away as part of a collective, either because they don’t want to be associated with that number or because of a certain amount of imposter syndrome that people experience. Sometimes folks feel that this is a huge amount of money to be giving as an individual and they’d rather be giving it together with other folks. Several people have said that after writing that first big check to Funding Queerly, the other checks they wrote to other groups got a little bit bigger, too. The other benefit is that we are able to introduce funders to small LGBTQ nonprofits that are doing really cutting edge work around the country that they might not have otherwise come across. Most of these groups are 90-plus percent foundation-funded. They don’t have individual donor programs. What that means is that unless you’re geographically close to them, you’re not going to hear about them. They aren’t putting their own resources into finding $1,000 donors because it’s not worth their time if they can get much bigger gifts from foundations. So it’s been really helpful for folks to participate and find out about the groups that are out there that they can continue to write checks to and spread the word about these groups way past their involvement in Funding Queerly. Funding Queerly only gives general operating grants. I’ve gotten to hear from groups how critically important this is for them, even the groups that we fund that are on the larger side of our parameters (closer to or at a $250,000 annual budget, which is still a small group!). Unrestricted funding allows groups to be responsive to what their community needs. Making general support grants sends the message that we trust them to know what to do with the money and that we picked that group because we believe in them, not because we want them to implement a particular program that we had in mind. Several of the groups have said that while the money is really important, getting to know that someone believes that their work is valuable is also very meaningful to them. Different people get different messages about how giving works. For folks with wealth who are trying to figure out how to put their money where their values are it can be somewhat of an isolating process. To do it within a collective with other folks who you have relationships with is really helpful and allows for a kind of bravery and boldness that translates into other parts of your giving. Giving collectively allows people to think about what’s possible in a way that can be hard to do on your own. We only know what we know, and I really appreciate the ways in which I’ve been challenged to think about what my own assumptions are, what my theory of change is, what I believe an “outcome” is and who even am I to measure outcomes of funding. There’s a certain bravery that gets instilled by doing this work together. Naomi Sobel is a writer, organizer, and queer femme with roots in New York, soft spots for Chicago and Boston, family in the Bay Area, and a home base in Los Angeles. She has deep roots in progressive Judaism and a burgeoning interest in harnessing her class privilege for radical social change. Naomi’s professional, political, and philanthropic home is the Astraea Lesbian Foundation for Justice, which works to advance LGBTQI human rights around the globe. She serves on the board of a family foundation, the Tikkun Olam Foundation, Inc., and spent two years on the planning committee for Making Money Make Change, an annual gathering where approximately 100 young people explore issues related to wealth, privilege, philanthropy, and participation in grassroots movements for justice and equality.